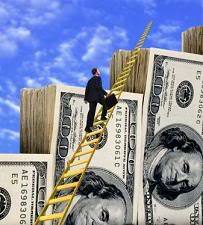 The Financial Ladder: The 2006 worlds richest people! It's that time of year again, Forbes compilation of the worlds richest people. Not so surpisingly the list of Billionaires has increased by 102 people up to 793, which is an all time record! They found the average net worth is $3.3 Billion dollars, and their combined wealth is $2.6 Trillion, which is up 18% since last March. The worlds Billionaires have come a long way since 1986 increasing 653 among their ranks. They attribute this surge to strong stock markets around the world (with us being the exception). America leads the way with 44 new Billionaires, and makes up nearly half of the list of the worlds Billionaires, with Bill Gates hanging on at the top of the list. The second runner up was India with 10 new Billionaires, with help from the sensex market which up 54% in the past 12 months. China added 4 new billionaires which is double of what they had last year. Russia grew 7 new Billionaires this year up to 33 in total, equalling $173 Billion. Their RTS stock exchange was up 108%, nice. Those are the juicy bits.